Land is a gift of nature to humans. Those who work hard to cultivate it, shall get their fruit of f labour. The tribals, who were once called as the sons of forest’, lived”with the above ideology for as long as they could. They used natural resources available to them, cultivated lands and lived on their own for many centuries. But with the advent of the Europeans and especially daily the British into the country the situation changed completely Along with the British, local [ landlords, capitalists and so called noble families entered the fray and started exploiting the tribals in every way they could. They turned the lands of tribals/Girijans into trading commodities and sold them at large scale, which complete by changed the life style of Girijans and also suppressed and tortured them and their languages and culture. As the levels of tribals became trading centres, they could no longer cultivate them or continue living there like beggars. After a time they started to revolt against authorities. During the early part of the 18th century, the tribals of Telangana, under the rule of Nizam, were almost completely isolated from the outside world and led their own lives with self sufficiency. The Nizam government at first did not show any interest L towards the tribal lands or their life styles and left ‘ them to their own devices. That was why their lands were safe then. But later, when Nizam had given off” several circars to the British, he agreed to a number of surveys and deals. The British helped Nizam by providing military help and in exchange started to dominate and con¬trol the interior parts of the state where they could gather raw materials for free. They started to turn the tribal lands into trading centres for their benefit. The land survey deals of the British brought profits to Nizam, as he could control all the lands that were surveyed, impose taxes on them and increase his revenues. During the second part of 18th century, the practice of renting tribal lands to non-tribals started. This brought even more profits to the coffers of Nizam but he had pay all that money for the mili¬tary provided by the British. So, the Nizam govern¬ment increased taxes on tribal lands and took over the lands of those who could not pay the taxes. These lands in turn went under the control of the British. Between 1920 and 1930, tribals, especially gonds of Adilabad, lost thousands of acres of land and permanent rights as they could not pay taxes or show claims that the lands were their own. 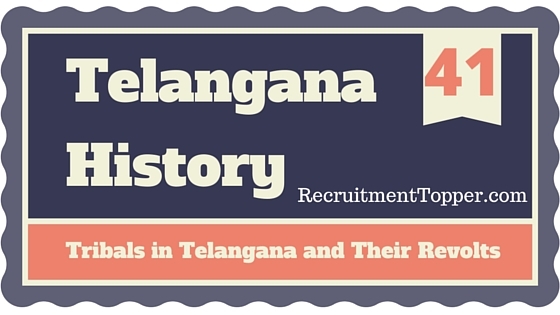 Not only that, but the Nizam government encouraged the British to dominate and handed over tribal lands to them. Later on, revolutionary changes occurred in transport and communication fields and non-trib¬als, non-farmers and others began to enter into the tribal lands and occupy them. In 1920 the Nizam invited non-tribals to live in the tribal lands as a part of his new policy. Army forces were sent to suppress the tribals when they revolted. Many tribes revolted against local rulers and British imperialists in this process. The chief goals of their movements were to reclaim their lands and land rights. The Government, led by komuram Bhim opposing the Nizam government occurred in 1940 in Adilabad. Five more armed struggles of tribals occurred in the Eastern mountain area. The first two occurred between 1902-03 at Rampachodavarm of East Godavari district they were led by Rama Bhupati. The third revolt occurred between 1922-24 under the leadership of Alluri Sitaramaraju. The fourth, led by Komuram Bhim occurred in 1940 and fifth was fought in Srikakulam and Khammam. Gonds of Adilabad, led by komuram Bhim revolted against the atrocities of government officers and non-trihals near Dhanara Reserve forest region to protect their agricultural lands in 1940s. By then landlords, capitalists, traders and business¬men, migrated from other regions, settled there,occupied the tribal lands and created social differences at a large scale. Bhim, who was a liter¬ate, tried to solve the problems of his tribal people in the hill village of Babjire Moguli. But, as the tribals had no proofs of land ownership it used to be very easy for the forest officials to vacate them from their lands. Thodgh this led to an armed struggle, the tribals could not get land rights. This battle went on until the 1940s. Bhim sent a number of requisitions, to the government to reclaim the lands of tribals. Meanwhile, land lords settled in the region sup¬pressed the protests of Gond sled by Bhim brutally, with the help of the police, several Gonds died during the police shooting. During this period, the tribals of Telangana bat-tled against the land lords with the help of commu¬nist leaders. This movement mainly occurred to oppose the highest rate of taxes imposed in the Khammam regions and also to oppose the shooting of Machcha Veeraiah and Gangavarapu Srinivasa Rao and the arrest of Machikanti Ramakrishna Rao,all communist leaders of the region. During this struggle, the police shot to death 31 permanent activists (of communist party), 4 zonal committee members and 5 central organisers until 1951. Because of this struggle, the party had to rebuild its structure in the region completely. This struggle expanded to forest areas like Paloncha, East yellan¬du of Madhira Taluq and 200 neighbouring villages. 20,000 farm workers participated in it between June and December of 1949, so that their wages were increased two fold. The government forces killed 45 people in a single day in the Allampally area of paloncha region during this struggle. The communist party had become strong in the yellandu Taluq and Khammam district and expanded to forest areas in this strug¬gle. The officers and supervisors of the area used to take tribes from the contractors and paid very low wages to the workers. The communist party activists worked hard to make people aware of their exploitation. They collected people of each and every village and educated and awakened them to the policies and corruption of the government and land lords. It also propagated parts ideals and goals. The communist party formed village groups (Dalalu), encouraged young men and women to become leaders of the groups. Koyas of the regions joined these groups mostly. Tribals of yellandu and Paloncha regions had become capable to resolve their own problems. This movement had a great impact on the gonds of Adilabad. The movements of tribals mostly occurred in Warangal, Khammam and Karimnagar dis¬tricts under the leadership of the communist party. The lands of tribals grabbed unfairly were reclaimed in many places. The Agency area tribals in Andhra Pradesh were called as naxalites, because the Jatavu and Savara tribes of Srikakulam and Odisha coastal areas revolted under the leadership of Naxalites. The rebel movement started at Naxalbury in , Darjeeling region of West Bengal was later named as the Naxalite movement. This was started by Majumdar and Kanu Sanyal and later spread to Odisha and Andhra Pradesh. The movement lost its power in A.P by 1970-80.According to social scientist Hymendorf, who r conducted research on the life styles of tribals, the tribals learnt to drink and use drugs from the migrants of Delta regions. These migrants not only taught those vices to tribals but also occupied their lands. Though the government enacted laws and amendments from time to time, they failed to control the atrocities against the tribals. money lenders of the Asifabad Taluq. Beedi workers, farm workers and labourers participated at a large scale in it. This association spread the traditions and culture of the tribals through cultural programmes in their own languages and awakened people the ‘Jana Natya Mandali’ was established for this by the communist party. The mandali brought tribals into movements through these programmes. The meetings of the party and Mandali were conducted at nights secretly because of police patrols. Tribal villages used to supply food for the activists of this association, because it helped tribals in many ways. In 1980, during a revolt of Girijans- at Iiidravelli region, 13 people died in police’ shooting. This led the tribals to increase their movement. After this incident, the tribals conducted ‘people’s courts’ with the support of Sangham. Tribals and others were appointed as members of these courts. The courts some times reclaimed lands from land¬lords and distributed them to tribals. But these courts later implemented brutal punishments like cutting of limbs and others. This led the government to enact a law which prevented the transfer of tribal lands to non-tribals. In same cases, the people’s courts sent requisitions to the government and Resolved the tribal problems through G.os. The people’s courts also addressed other problems like dowry and violence against women, but failed to pre¬vent the occupation of tribal lands in same places later, where the local people were more powerful. By the end of the decade of 1980, the tribal movement had become systematic student and labourers also joined it at a large scale opposing the dominance of land lords and police. They refused to pay land taxes at Indravelli, which led to police shooting and the central government interfered and declared the area as turbulent. In 1984 March, tribals of Satanla river irrigation project area, demanded compensation for the 300 acres lands they lost during the construction of the project. In 1985, the second Tribal conference was held and tight security taken by the state government. The Adilabad district faced severe drought in 1988 during which tribals looted the godowns, shops and houses of traders. An armed struggle at pemilo of khanapur Taluq also occurred during this, in which more than 250 tribals participated. The state government on one hand tried to suppress it and on the other, tried to decrease it by helping the tribals. It introduced the rental reforms with the objective of bringing lands under the control of tribals. But the non-tribals could get a stay from the courts and the actions of government failed. The police and forest guards tried hard and resorted to violence to suppress this movement. They even used the TADA Act, burnt the huts of tribals and killed many in Bodh taluq. The workers who bought for higher wages and other rights were suspended under the leadership of peddiraju, the then president of tribal association (Sangham) the movement had intensi¬fied. Peddiraju presided over a meeting of Sangham at chenumur Taluq in 1984. After this meeting peddiraju and other leaders were arrested by the police under the National security Act. Later, the intensity of the movement decreased but the Sangham continued to work to solve the problems of tribals. The Indian constitution directed each and every state to protect the tribals fropi exploitation and also to encourage education and other fields in the tribal areas for their welfare. The Andhra Pradesh govern¬ment enacted some laws to protect the scheduled areas (of tribals) under the 5th schedule, Para 5 (z) of the Indian constitution. In 1937, the Nizam government brought the land exchange regulation experimentally for the first time in the tribal areas. Two important points of that regulations were. 1. According to the regulations, a person who was not a member of the protected community could sell his land to another person or group who comes under his own community, without the permission of Taluqdar. But he had to keep a piece of land with a value of Rs.30 permanently with him. 2. The extent of this regulations was limited to the members of the protected community who paid atleast Rs.500 to the government (as tax). According to other previous laws, he could sell surplus land. The above rule considered the group which could pay Rs. 500 per month (as tax) as the protect¬ed group. This above regulation was misused by land owners. brought to unite all the Acts on tribal lands under an umbrella rule. This rule introduced following actions to protect tribal lands. The land assets in tribal lands could not be sold/mortgaged to non-tribajs without permission of the special officer and such negotiations would be deemed null and void. If they were transferred to non-tribals, they should be returned to the same person (who transferred them) or his legal heirs. If the legal heirs would not take them back or could not be found, the appointed officer should sell those lands to other tribals or co-operative societies (of tribals) or should declare them as government lands. Though there were so many rules and regulations and laws regarding tribal lands because of problems of implementation, they were still sold/given to non-tribals in following ways. 1. Transferring the land belonging to a tribal to another tribal who worked under a non-trib- al land owner or businessman. 3. Though tribals were the owners of lands, they were refused pattas (documents) and land was cultivated by others. All the above led to tribals losing their lands time and again. All these were recognised and addressed to in 1970 and another amendment Act was introduced on 1 July, 1970, which came into implementation from 1971. The Act was applied to all lands under the tribal areas except Mahar and’ Multhas lands. According to it, each and every farmer who owned a piece of land should maintain an official Ryotwari Patta (document) one regulation in this Act Rule-1, was amended in 1971. Co-opera¬tive societies and mortgage banks formed under Rule-1 faced losses. So to remove technical prob¬lems, the government amended section-3 of Rule-1 in the above Act. According to the amendment, If tribals mortgage their lands and could not pay back the loan, their lands should be resold to tribals only. Though this amendment was strictly implemented, due to official problems, these lands again went to non-tribals. Finally, Government, through G.O.M.S. 129 provided access to non-tribals also in the tribal areas with same rules and conditions. In 1974, the collector of Khammam district, tried to vacate lands occupied by non-tribals in the district, according to government order, following a resolution by the local Zilla Parishad. But non-trib- al poor were exempted from this. Non-tribal poor were given permission to own upto 5 acres of wet lands and 10 acres of drylands. It was feared that with this, restriction on tribal lands would be lifted and non-tribals would get the upper hand. Then the district collector, alongwith Agency divisional offi¬cers, Tribal welfare deputy collector and project offi¬cers of ITDAS joined hands to vacate non-tribals from tribal lands and to give the lands back to con¬cerned tribal persons or their legal heirs. A tribal welfare department was established under ministry of Home at the centre to supervise the welfare and development of the tribals. The gov¬ernment of A.P. also had undertaken many activities and enacted a number of regulations and Acts for the welfare of tribals in the state. 2. In which decade, Nizam Govt, handed over . the tribal lands to the Britishers? . 4. Mostly Gonds are residing in which district? 5. Under whose leadership, Gonds revolted against Nizam Govt.? 6. Komuram Bhim revolted in which reserve forest? 7. The tribals are prepared to join hands with whom during Telangana armed struggle? 8. Who arrested and died in Khammam dis¬trict fighting? 9. Among the following which one is the Andhra Pradesh Agency Tribal Movement? 10. Which tribe fought under the leadership of Naxalites? 11. Where the Naxalite movement started at first? 12. Naxalbari area situated in which State? 14 Who lived with tribals in Adilabad forest area, learned their language and changed them as literates? 15. In which year Girijana raitu kuli sangham (Tribal farm labour society) was formed? 1. Viplava natya mandali . 2. 18th April, 1982 . 20. The Govt, which arrested the leaders of Tribals conference and the leaders of Society in 1985? 21. In which district famine occurred in 1988? 22. In which year, Nizam Govt, brought the land exchange provision experimentally for the first time? 23. According to which order Govt, provided the place to non-tribals in tribal lands? 25. Under whose control, the programme of removal of non-tribals from tribal lands and handed over that land to the original owners was organised?